Heat oven to 350°F. Grease or spray each of 12 regular-size muffin cups. Remove cookie dough from pouch; cut dough into 12 slices. Firmly press 1 slice in bottom and up side of each muffin cup. Bake 9 to 11 minutes or until golden brown. Cool completely, about 1 hour. 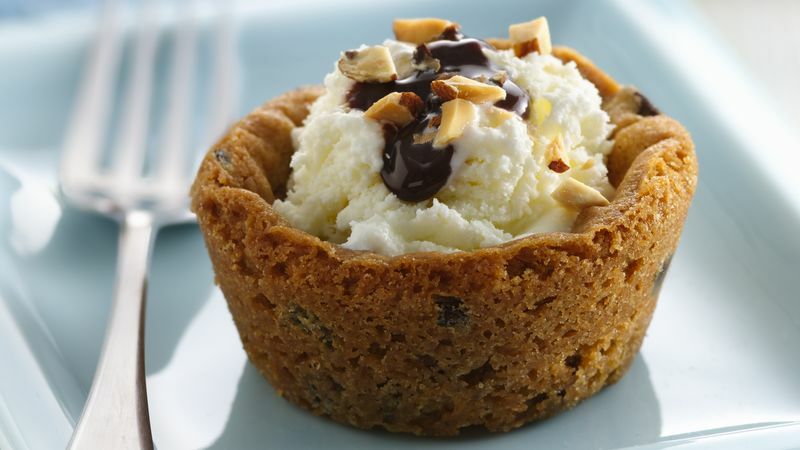 Spoon 1 teaspoon hot fudge into each cup; top with 1 teaspoon chopped almonds. Divide ice cream evenly among cups. Freeze uncovered until firm, about 3 hours. Let stand at room temperature 5 minutes before serving. Garnish with remaining hot fudge and almonds.